The H.P. Lovecraft Historical Society (HPLHS) is one of the world’s pre-eminent continuers and innovators of the legacy of American horror writer H.P. Lovecraft (1890-1937). 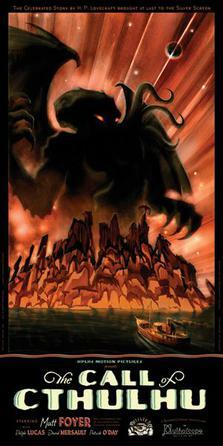 HPLHS has produced movies such as the black-and-white retro-masterpiece The Call of Cthulhu (2005), often considered to be the best adaptation of Lovecraft’s work ever made, along with audio dramas, games, books and props. Following our recent review of Brotherhood of the Beast, Games vs Play caught up with HPLHS co-founder Sean Branney to find out more about his creative processes and the upcoming adaptation of Masks of Nyarlathotep. 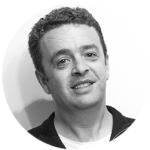 Games vs Play: Hi Sean, thanks so much for talking with us here on Games vs Play. We’re big fans of the work of the H.P. Lovecraft Historical Society, which was co-founded by yourself along with Phil Bell and Andrew Leman in Boulder, Colorado, in 1988 (yes, I read your “About” page!). 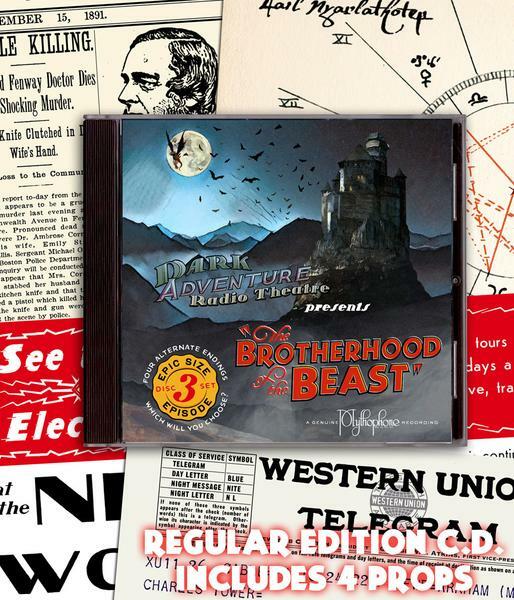 HPLHS has just released the audio drama Brotherhood of the Beast, the latest instalment in the Dark Adventure Radio Theatre (DART) series. 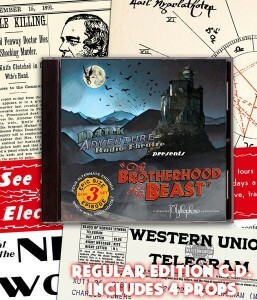 Made in the style of a 1930s radio serial, Brotherhood of the Beast is based on Chaosium’s Call of Cthulhu RPG campaign The Fungi From Yuggoth. 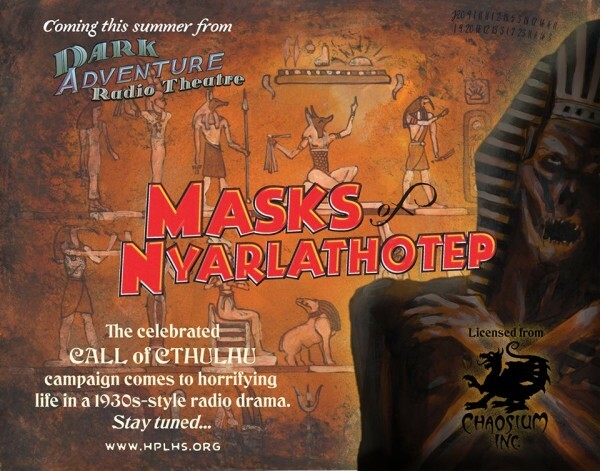 You’ve also just announced that the next DART audio drama will be an adaptation of the classic Call of Cthulhu campaign The Masks of Nyarlathotep, which is often called one of the best RPG campaigns of all time. Sean Branney: The HPLHS got it’s start as an organization for people interested in a live action role playing game (LARP) that we created called Cthulhu Lives! Back in the early ’80s we used to get together and play Chaosium’s RPG Call of Cthulhu. We thought it was a lot of fun. Many of us were theatre kids and thought it would be even more fun to round up some costumes, make some props, find some locations and play the game out in the real world. So, in this pre-Internet age, we invented our own rules and style of gaming. The live action games were great fun and most of the people who played in them wanted to play more. Before long, the games were getting larger and more complicated, sometimes stretching on for months. We finally founded the Society and published a small newsletter, Strange Aeons, to share what was going on and involve members from more remote geographic locations. GvP: As its many legions of fans know, Masks of Nyarlathotep has quite an open, sandbox structure to its narrative. What choices have you made to adapt this campaign into a storyline that works as a radio-drama? Sean: In a game like Masks, the Keeper and the players work collaboratively to unfold the narrative of the plot. The game responds to the players’ whims and luck (or lack thereof). In a scripted dramatization though, there’s no luck or whims involved. My colleague Andrew Leman and I have to make decisions about how the story will unfold, and what actions the investigators will take. It’s a challenging process with any story, but with an epic the size of Masks, it’s especially challenging. There’s also the challenge of collapsing time. For RPG gamers, a big campaign like Masks will probably be played over the course of months, in many multi-hour sessions. For us, we’re trying to tell the same story over the course of a couple of hours. We want to keep the sprawling global feel of the game, but we need the story to unfold quick enough that listeners can enjoy it in a single setting. Another interesting challenge is that the source campaign provides a plot and antagonists, but gamers would normally bring their own protagonists. So, in dramatizing it, we have to provide a set of characters to throw into this adventure and make sure they’re a compelling team. GvP: Without giving away any spoilers, can you give us a hint about any big changes you’ve made in your version of Masks? Sean: I can’t say too much, but I can confirm that there’s many things which happen (or may happen) in the game supplement which don’t happen in the radio play. Masks has a number of red herrings and plot detours which can be great fun for players but which just trip up a dramatization. We’ve had to prune the story down quite a bit. But we hope the way that some of the climactic moments unfold will be satisfying to those who know and love the game. GvP: When you’re adapting one of Lovecraft’s stories you have a “script” of sorts to go on, I suppose. But RPG scenarios are by definition open to interpretation, so that each group of players and Keepers can create their own adventure. What do you think is the greatest challenge in adapting an RPG scenario into another medium? Sean: You’ve hit the nail on the head there. In writing a script, all variables go away. A specific set of events unfold in a specific manner and that’s that. We try and make the investigators in our story take the kinds of actions that investigators in a game might take. There are moments where we hope RPGers can feel hit points being lost or a Sanity roll being missed. But in the end, it’s all about storytelling. Our job is to try and take the setup given by the game and dramatize it so that it tells and awesome and compelling story. GvP: Apart from RPGs and Lovecraft’s writings, what have been some of the other major influences on the HPLHS? Sean: A big part of how our organization came to be is because of theatre. As I mentioned earlier, back in the early days, most of our gaming crowd were theatre students. My colleague Andrew Leman and I both went on to get post-graduate degrees in theatre and have created theatre at a professional level over the course of our lives. One of the things theatre demands of its creators is the ability to find a way to create a virtual world in a hurry and with limited resources. Coming out of that tradition, we’re very used to taking on big projects with limited resources, and when you can’t solve a creative challenge by throwing money at it, you have to find other ways of getting the job done. I think that approach has been behind much of what we do at the HPLHS and it’s served us pretty well over the years. GvP: Looking ahead now, are there any other games or scenarios that you’d be interested in adapting? Sean: At the moment there’s no other published game materials we’re planning to adapt. Over the years we wrote about sixty original Cthulhu Lives games and there’s a few of those which we think could make for thrilling radio theatre. GvP: So, would the HPLHS ever consider producing something more explicitly game-like, such as a roleplaying scenario or other tabletop game? Sean: We do have a few things in the works of that nature. We’ve been working for years on our Arkham Sanitarium Sanity Assessment Kit that is a fascinating blend of a board game and a psychiatric diagnostic tool. Players go through three batteries of psychiatric diagnostic “games” which are carefully integrated to determine not only how crazy you are, but what kind of crazy. We’ve done a lot of play testing and it’s proved to be quite fun. We’re working on finding solutions to some manufacturing challenges to try and bring the game’s cost down. But it’ll be coming out one of these days. 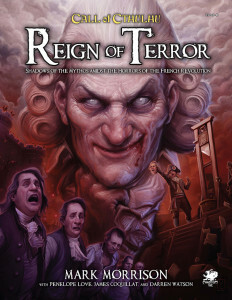 I’ve also got plans for a pretty ambitious project for the Call of Cthulhu RPG. I’ve quite enjoyed how the game has branched out from the world of 1920s New England to other times and places in history. I found Mark Morrison’s recent Reign of Terror campaign quite inspiring and it’s spurred me on to develop something of my own, set in a time and place where the Cthulhu Mythos has been woefully under-represented. GvP: Sounds intriguing! Ok, we’re nearly at the end of the interview, but we still have two very important questions which we ask all our guests who are involved in the Cthulhu Mythos in some way. If you were a dark cultist (and I’m not saying you’re not), which Great Old One would you worship, and why? Sean: If I were a dark cultist (and many people will wonder why this question has been posited as a hypothetical) I would worship Great Cthulhu. I find most traditional expressions of religion to be rather drab and tedious affairs. If I were going to sign onto a cult, I’d want a service where animal fury and orgiastic licence whipped themselves to daemoniac heights by howls and squawking ecstasies that tore and reverberated through those nighted woods like pestilential tempests from the gulfs of hell. GvP: Yes, well, I guess mainstream religions do tend to skip the squawking ecstasies these day. This brings us to our final question. Given your preference for Old Squidface himself, how do you personally pronounce “Cthulhu”? Sean: Personally, I go for “kuh-THOO-loo”. Since it’s not a name with human origins, I figure your accent’s going to be all wrong anyway if you don’t have a beak. Second, and perhaps more importantly, we have written a lot of Lovecraftian lyrics for popular music (see A Shoggoth on the Roof, A Very Scary Solstice, The Curious Sea Shanties of Innsmouth, Mass. etc…) and that pronunciation works better in musical scansion and is easier to rhyme with than any of the pronunciations which involve bleating, barking or croaking. Keep an eye on the H.P. 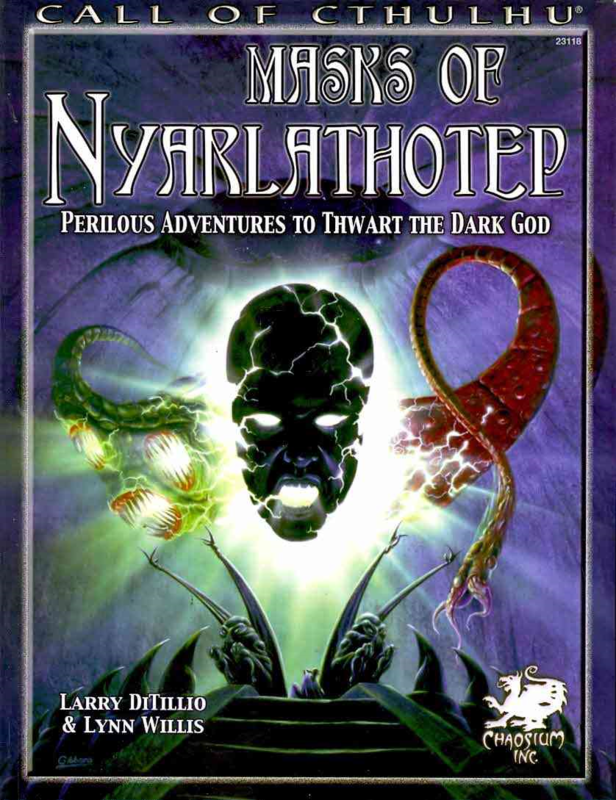 Lovecraft Historical Society website for the release date of Masks of Nyarlathotep. To find out more about the latest reviews, stories and other cool things in the world of games, like us on Facebook. And remember – if you’re game, we’ll play! Image sources: Banner, HPLHS logo, Brotherhood of the Beast cover and Call of Cthulhu movie poster – H.P. Lovecraft Historical Society; Masks of Nyarlathotep and Reign of Terror covers – Chaosium; close up of Cthulhu Wars miniature – GMorts Chaotica.